I’m moving ever so slowly through a chunk of my untrieds, and today’s post features two of my growing collection of a-england polishes. This time around, I chose Whispering Waves and Spirit of the Moors. 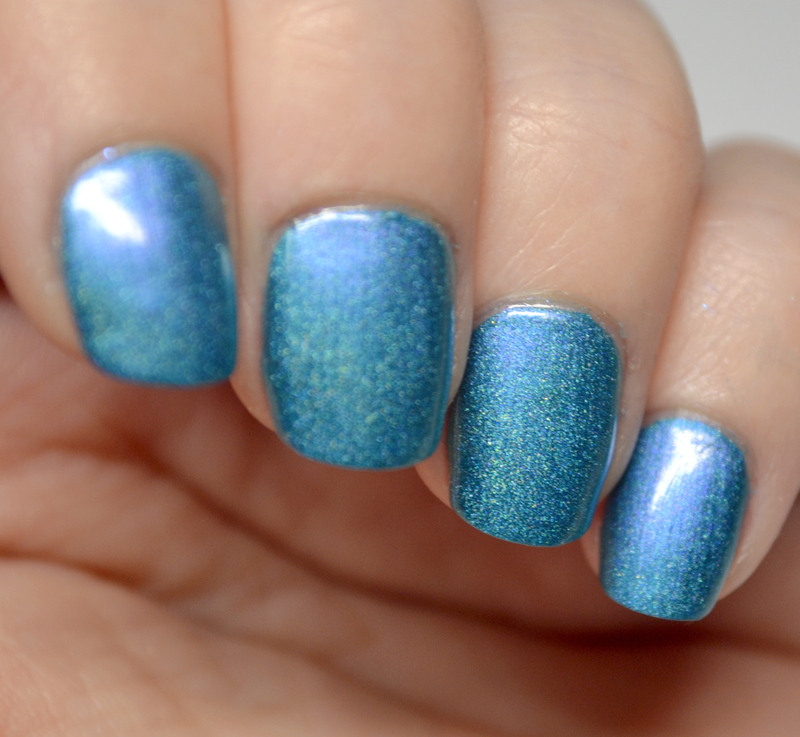 First up is Whispering Waves, a dark turquoise holo with a lavender shimmer. 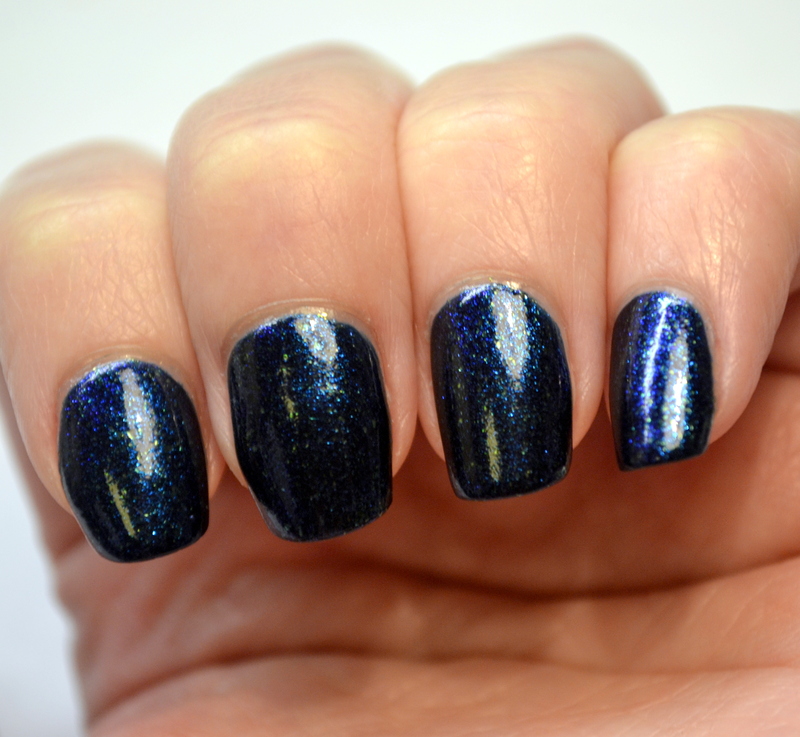 This one was good in 2 coats, but it unfortunately stained my nails. 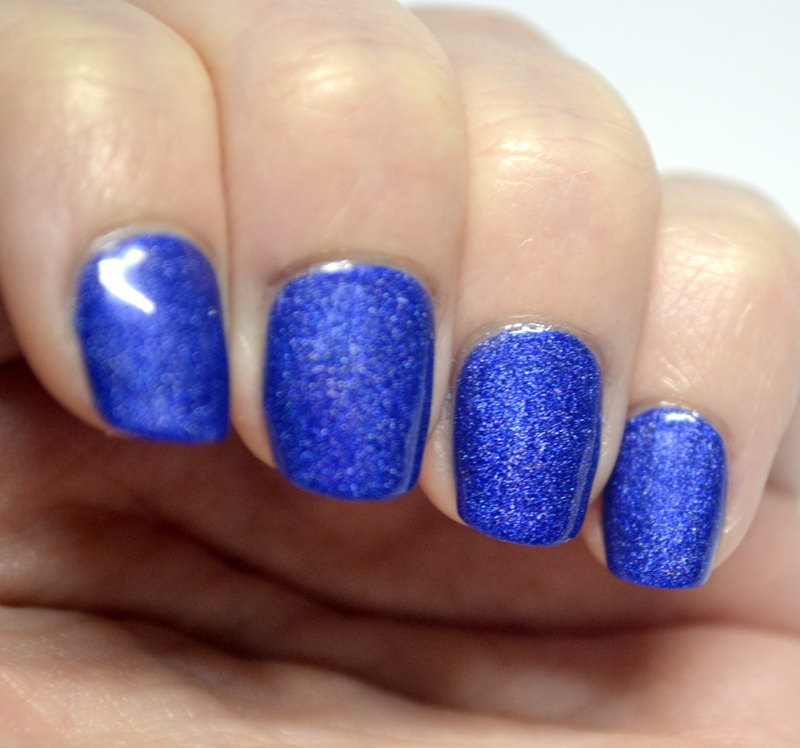 That doesn’t change the fact that it’s a very pretty polish. The second one I tried is Spirit of the Moors, and is definitely my favorite of the two. 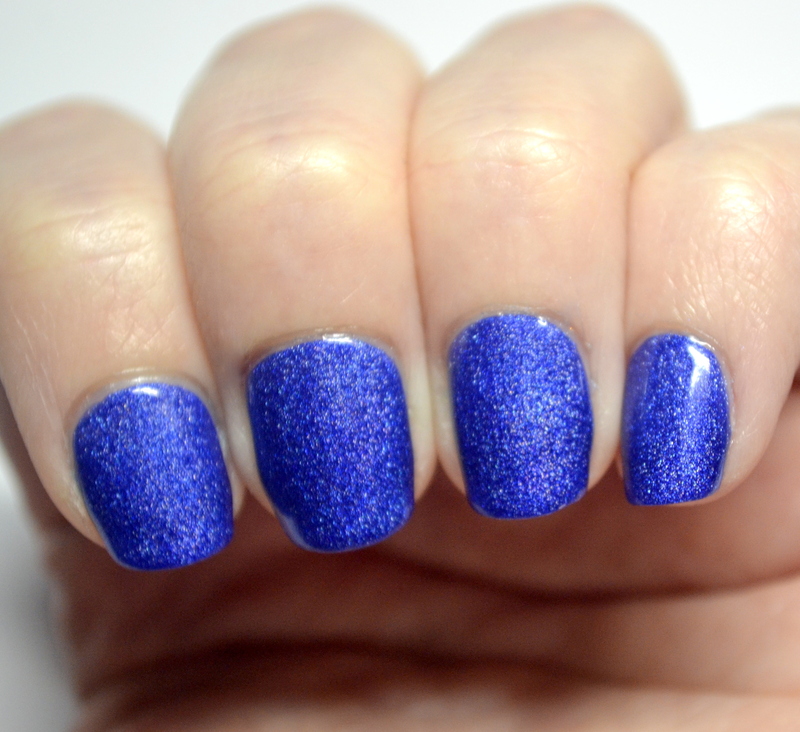 This one is a royal blue holo, also good in 2 coats, which was far brighter than I expected. That’s a good thing, by the way. 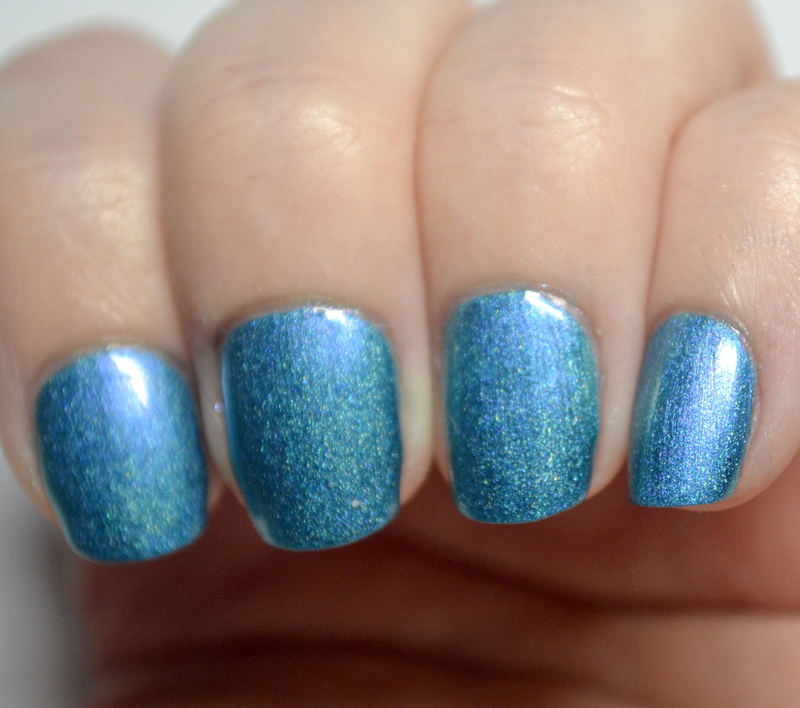 It is honestly a gorgeous polish. 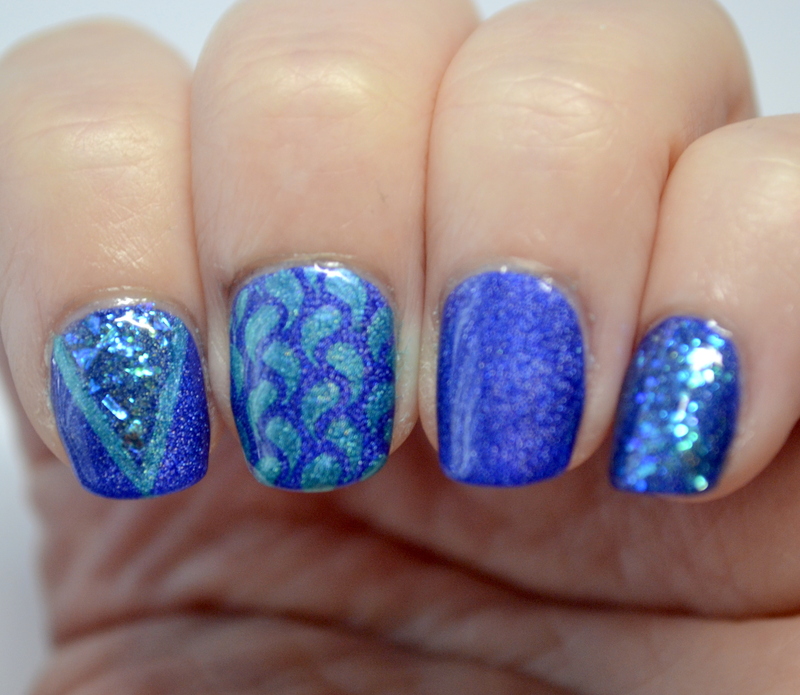 And after my experience with Whispering Waves, I was pleasantly surprised to find that this one actually did not stain my nails. 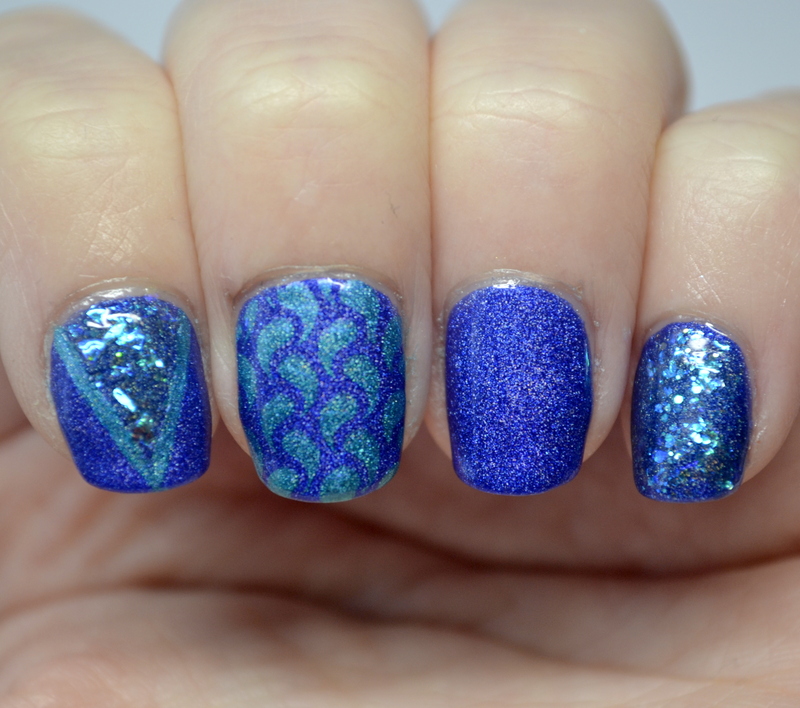 And since I loved Spirit of the Moors so much, I decided to use the two for nail art, with added help from Sinful Colors Green Ocean. 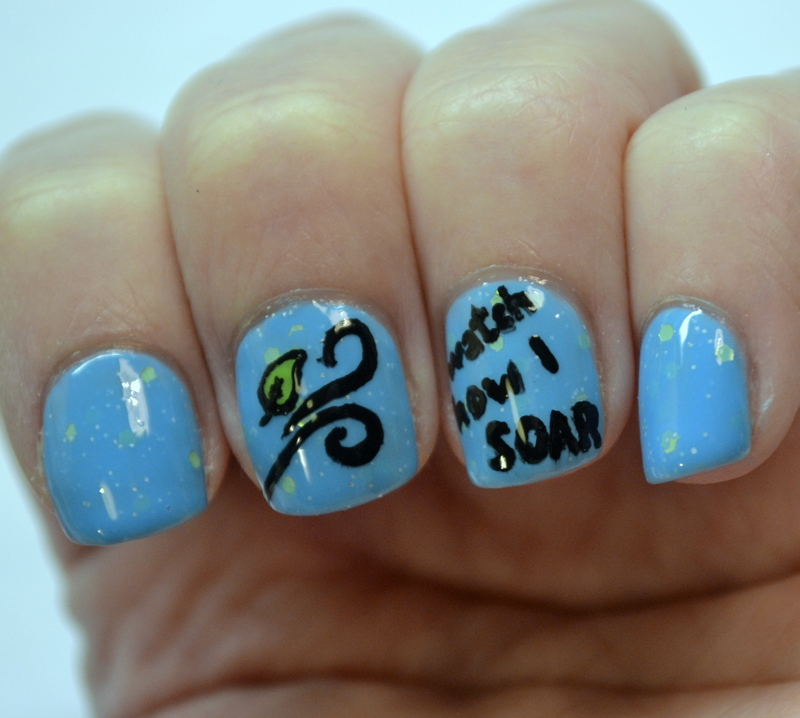 I ended up doing the design on both my hands and actually wore it for like four days. 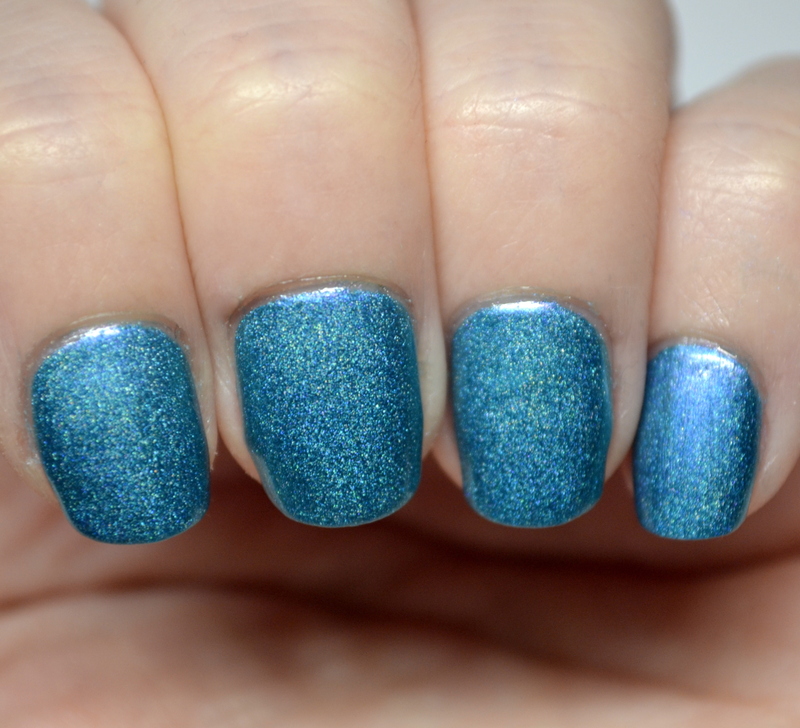 Seriously, Green Ocean was much shinier than I thought it would be, and I loved it with these two a-england polishes. In contrast to Day 16’s theme, I had so many ideas for Day 17’s shoe theme! I finally settled on Wellies. And what better way to display Wellies than have them splashing in rain puddles? Not too bad! I wish I had the patience to do more than one shoe, but oh well. I like the accent nail well enough. 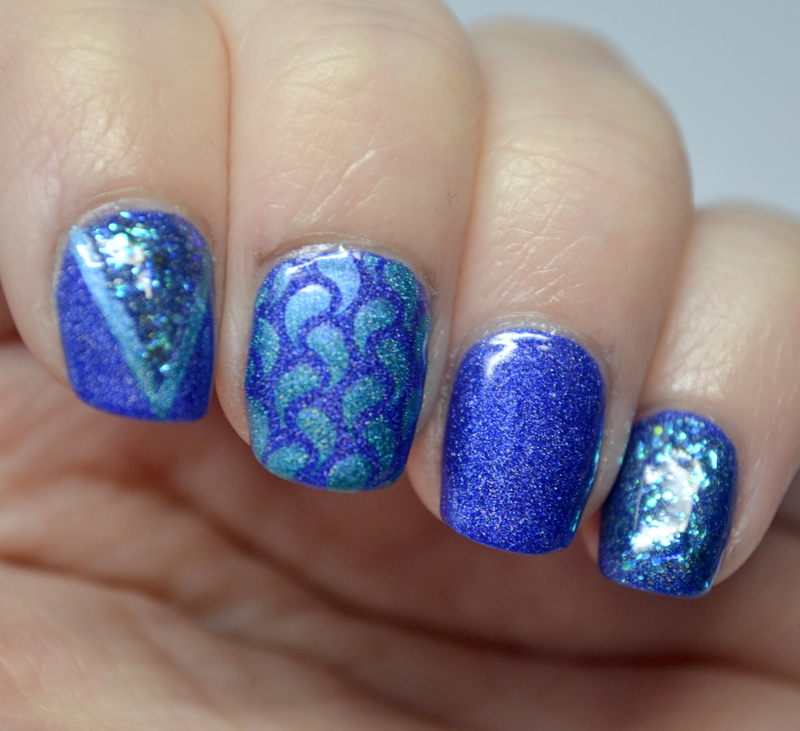 I never thought that I would ever do a fish themed mani and actually like it, but this one is actually kind of pretty. 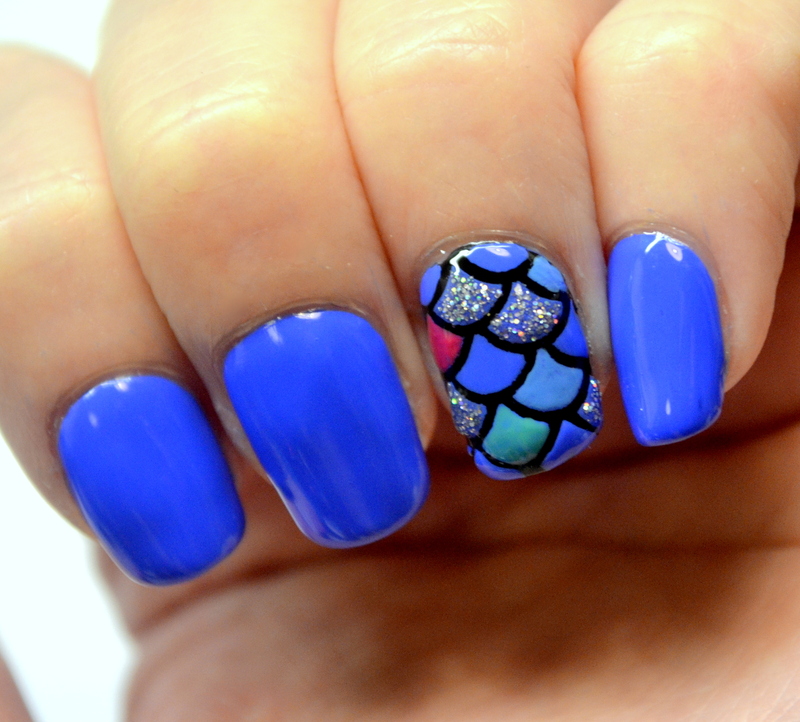 Since I also did my Day 13 book themed nail art before today’s prompt, my mind sort of connected the fish and book prompts and came up with The Rainbow Fish. 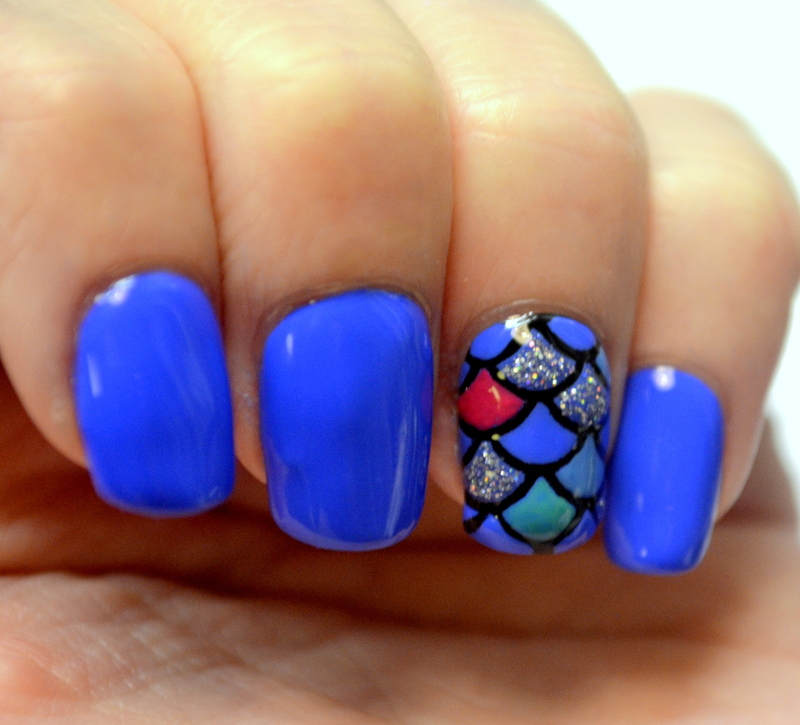 And as if it was fate, I also got my first ever nail vinyls in the mail today, and mermaid/fish scales were among them. 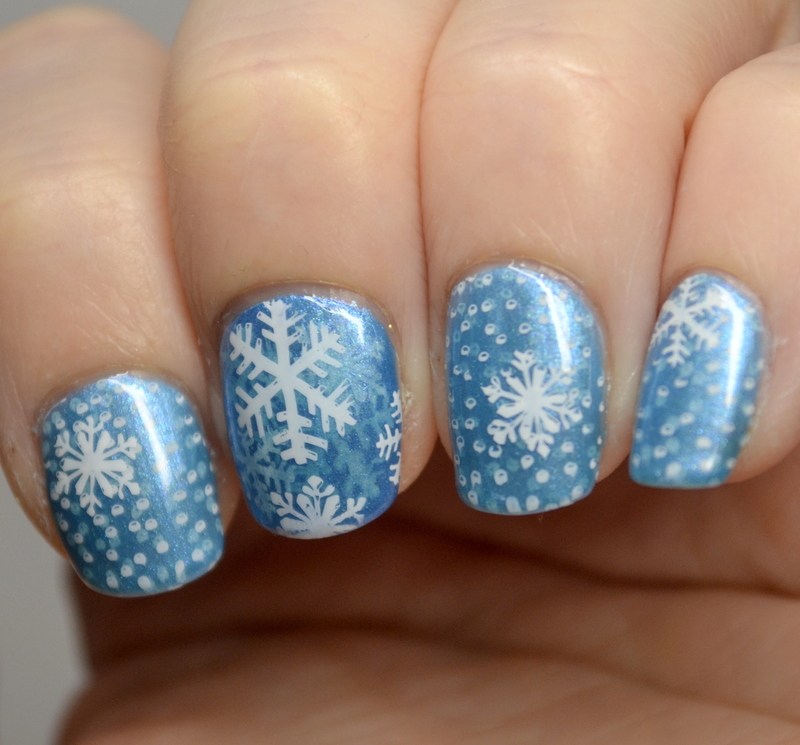 This mani also features a polish that sort of fits the theme too: the ever lovely original formula of Sally Hansen Pacific Blue. I filled in the other colored scales in by hand. I think it looks kind of awesome. Almost as good as the Rainbow Fish himself! 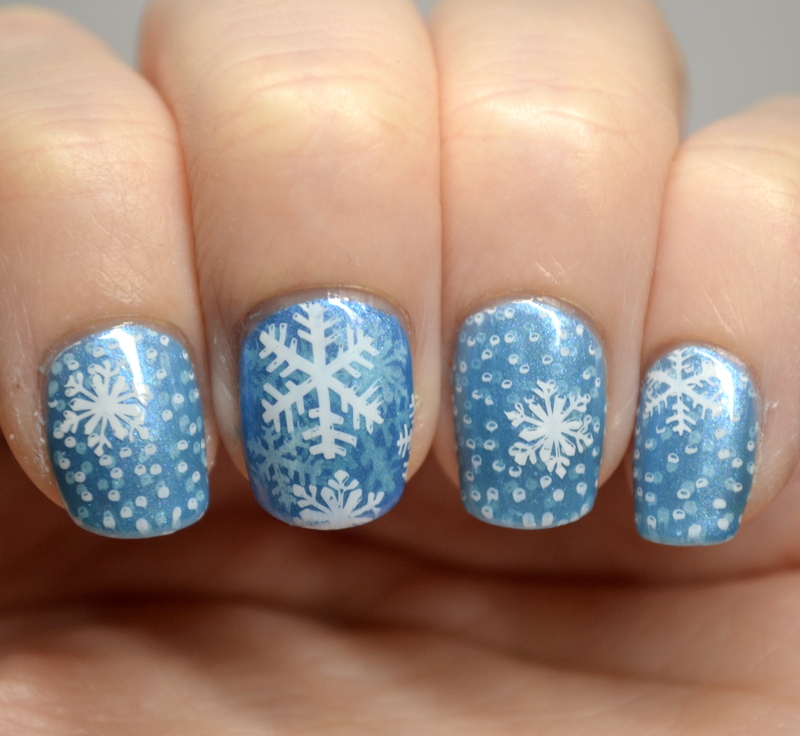 And it made me love how easy nail vinyls are. I have no idea why I didn’t try them before! Hello all! I meant to post this yesterday, but completely forgot. My college’s summer ball was a couple of days ago, and I of course did my nails for the occasion! 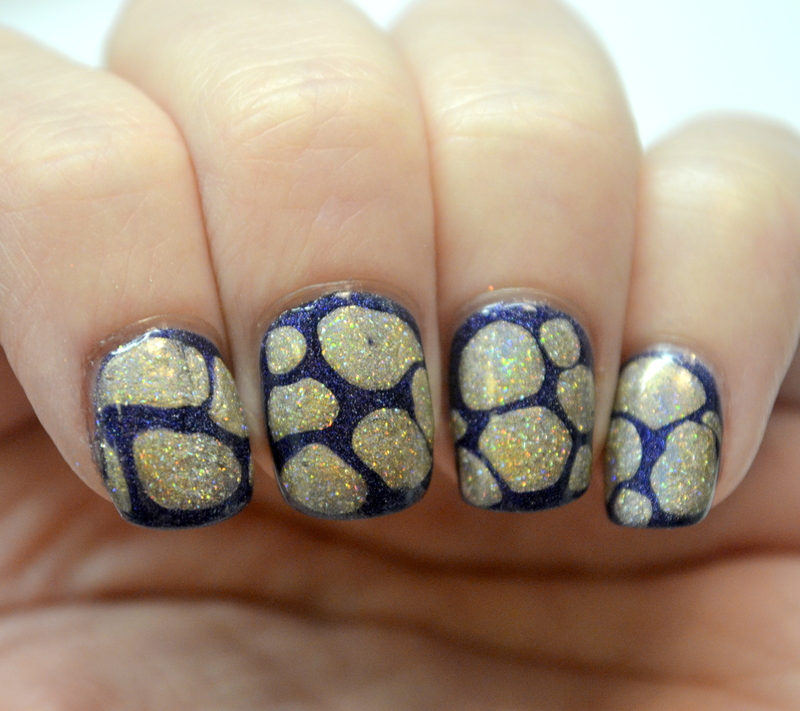 I hadn’t done a blobbicure in a while and it’s supposedly easy to do, so I chose to do one for the ball. 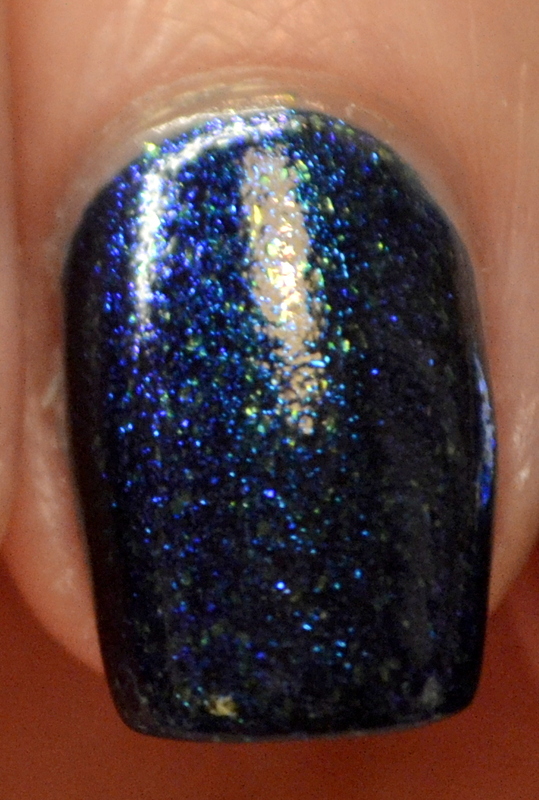 I had tried out a handful of holo blues on swatch sticks to find the best match for my dress, and a-england Tristam won. 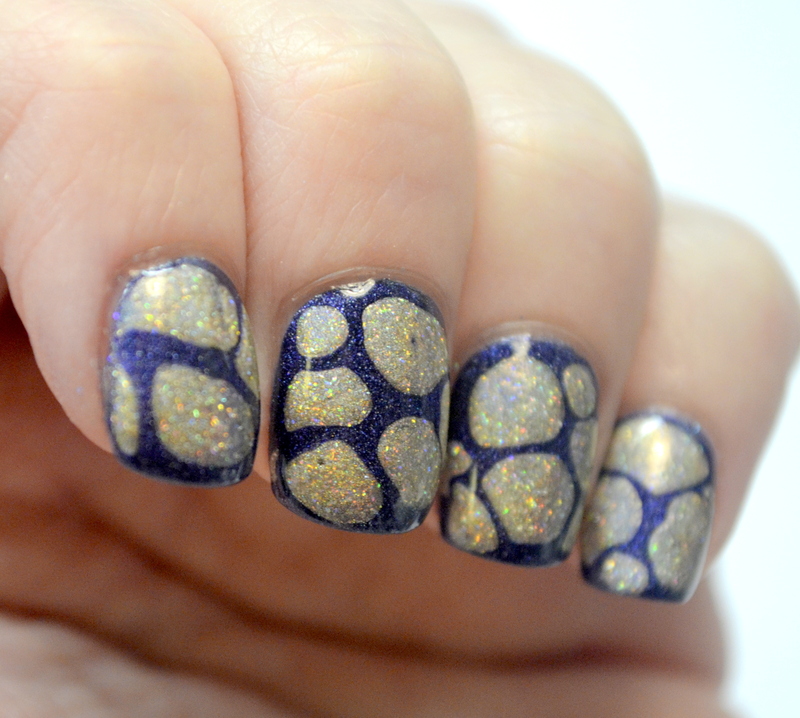 I paired it with ILNP I See You since it was a wonderfully close match to the accent color on my dress. Good evening everybody! I have had a pretty great day today– I got to play with dogs for the first time in months, had lots of sushi for lunch, and made pecan muffins for dinner. I’m feeling pretty good about this post too! I decided to try out my first Pahlish a few days ago, and so slapped on a couple of coats of Mad Man With A Box. 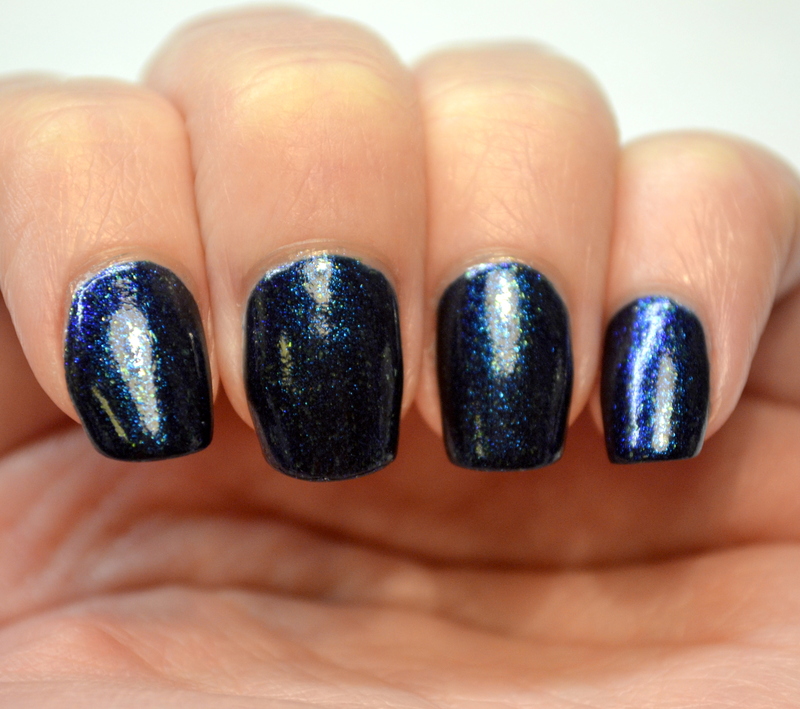 It’s a fantastically complex dark blue polish. From what I can tell, it’s got purple leanings at times, but predominantly has a blue-green shimmer (courtesy of the blue glass flecks) and gold microflakes. Lots going on, which made it difficult to capture everything in the photos. 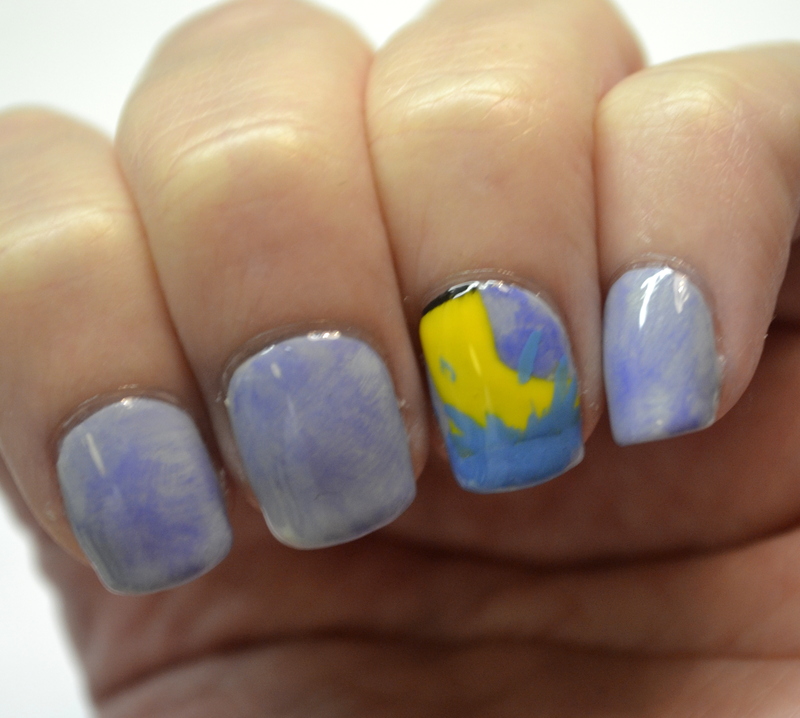 Now, it’s rare for a polish to inspire nail art. 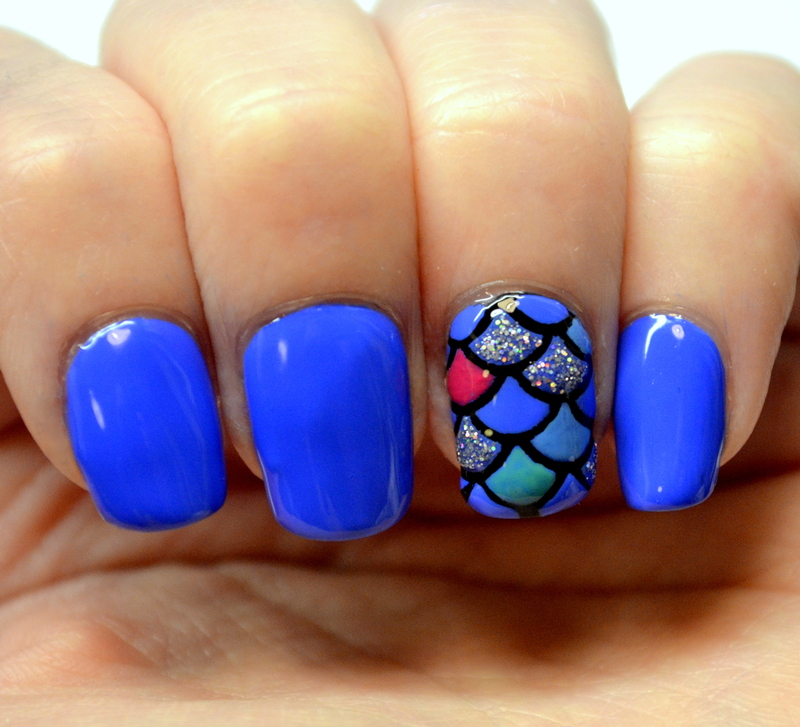 Normally when I feel like doing nail art, I have an idea from the beginning of what base color I want to use. 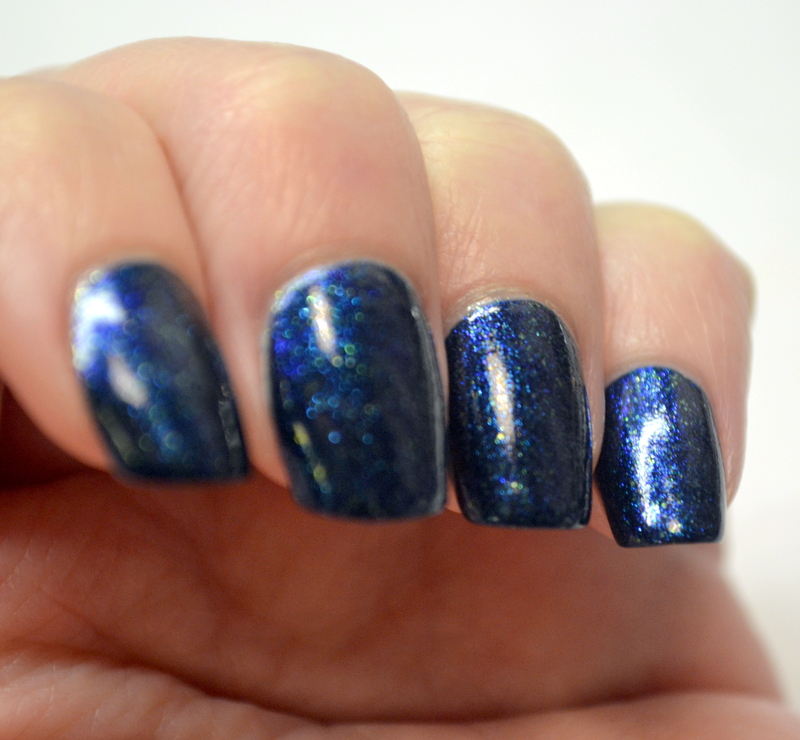 This polish, though, looked very much like starry skies to me, and for some reason my mind jumped to the falling stars in Howl’s Moving Castle. A pretty big stretch to go from a Doctor Who polish to a Miyazaki movie, but that’s how my mind works I guess. 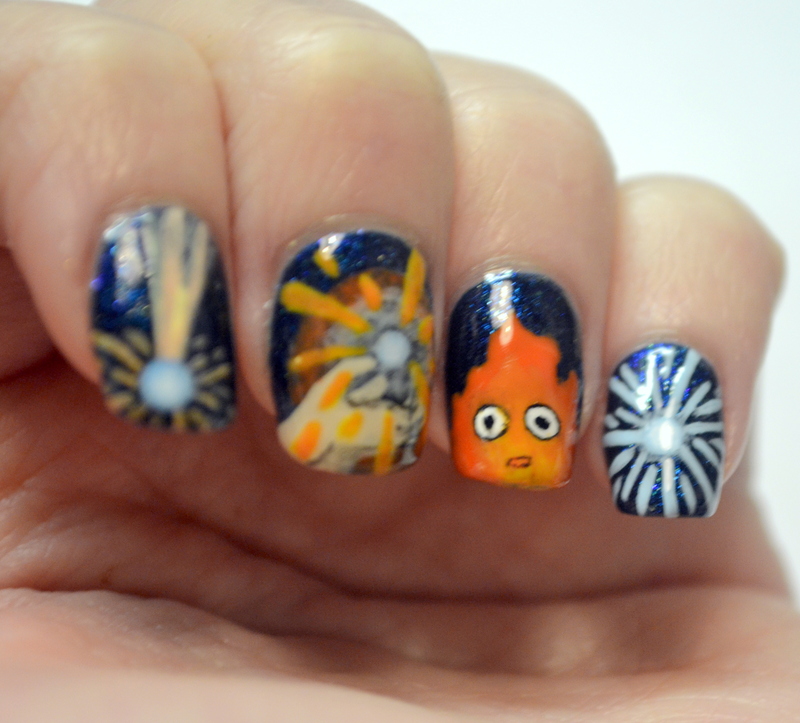 The falling stars, of course, led me to Calcifer. 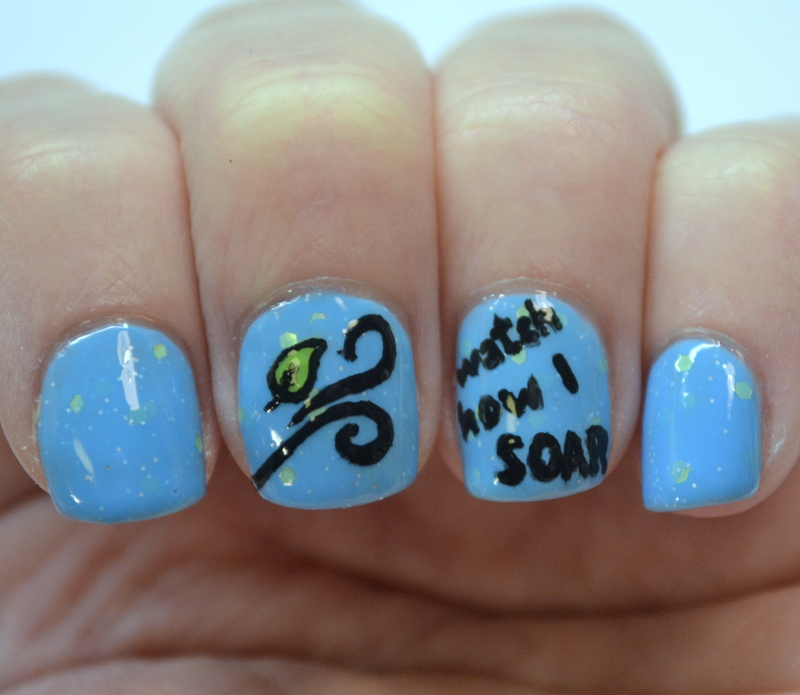 And so this mani is all about Cal! So I’ve got Calcifer when he’s a falling star, when Howl catches him, when he’s in his normal fire form, and when he becomes a star again at the end of the movie. Lots of polishes here to create such a simple character…Kleancolor Pastel Yellow, Pastel Orange, Pastel Blue, Tangerine Burst, and Black, Essie Avenue Maintain, FingerPaints Paper Mache, Colour Carnival by 17 Bright Orange, Maybelline Color Show Electric Yellow, and Barry M Lychee. 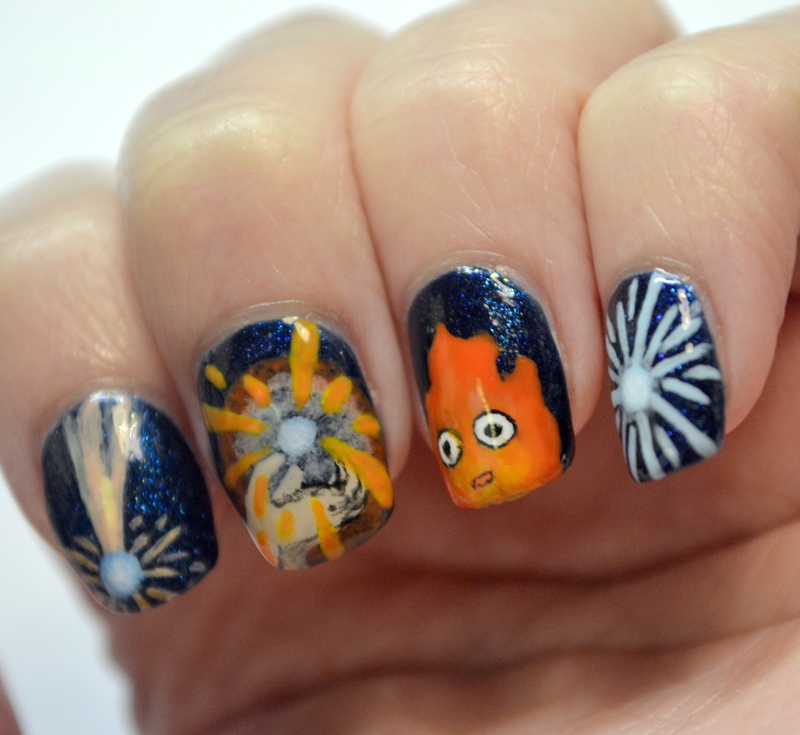 I was a little disappointed that I messed up that iconic little flame by putting his eyes way too close together, but I like the overall mani. I was absolutely thrilled with how the middle finger turned out since I had to paint Howl’s hands, but then that got messed up a little because my go-to top coat decided to go crazy. It contributed to Calcifer’s wonky eye too. 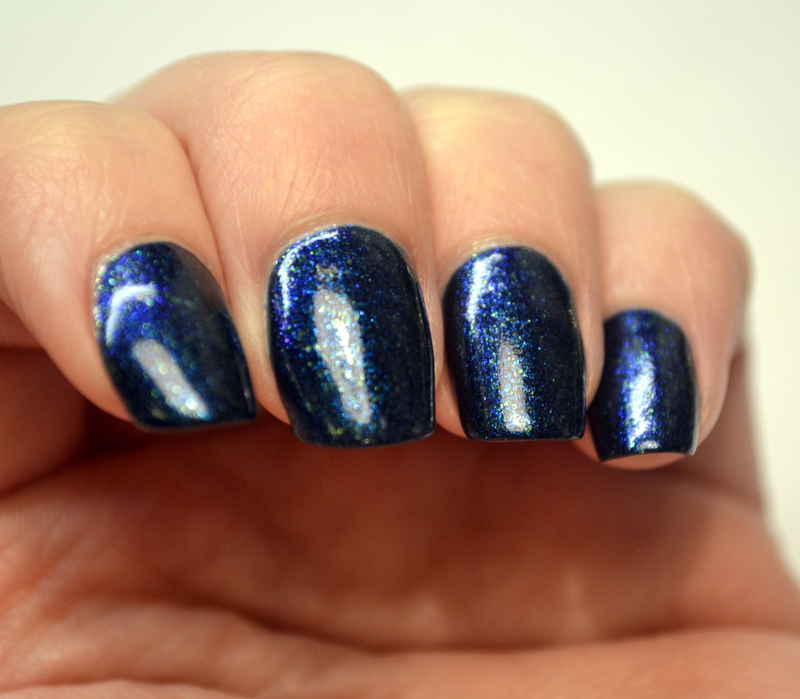 I’ve never really had any serious problem with smearing from Seche Vite, but it happened on two of four nails here, and I was not a happy camper. I didn’t let it put a damper on my mood though! 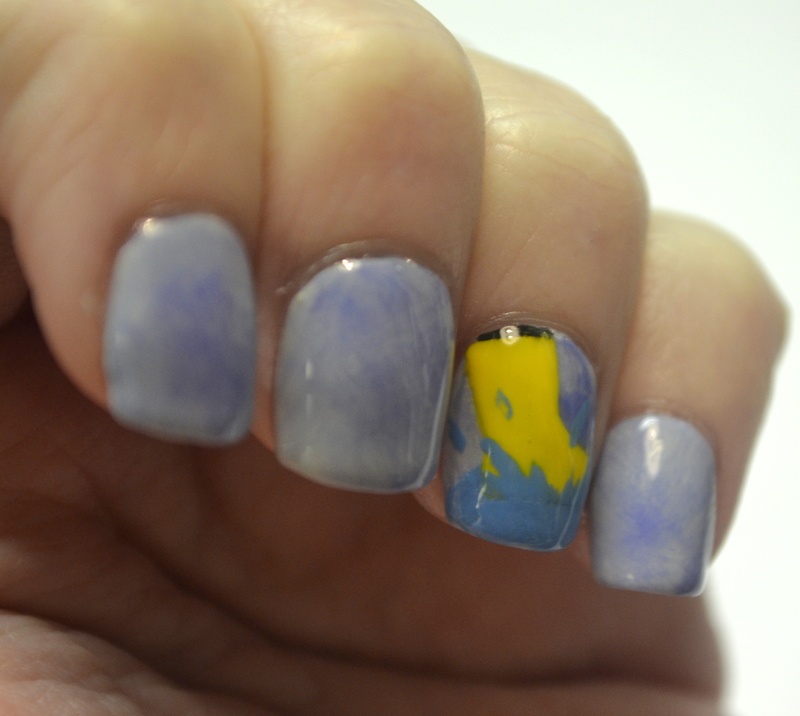 I was still incredibly happy with this nail art. Good afternoon, everybody! Today’s prompt for the CYNA All Things Blue theme is ‘Windy Weather’ and is probably the prompt that I was most excited about. My original idea was to have a cloud-guy blowing air across my nails, but after Googling ‘wind’ to get an image reference, I saw a tree with its leaves being blown off and the thought “I’m a leaf on the wind” immediately came to mind. 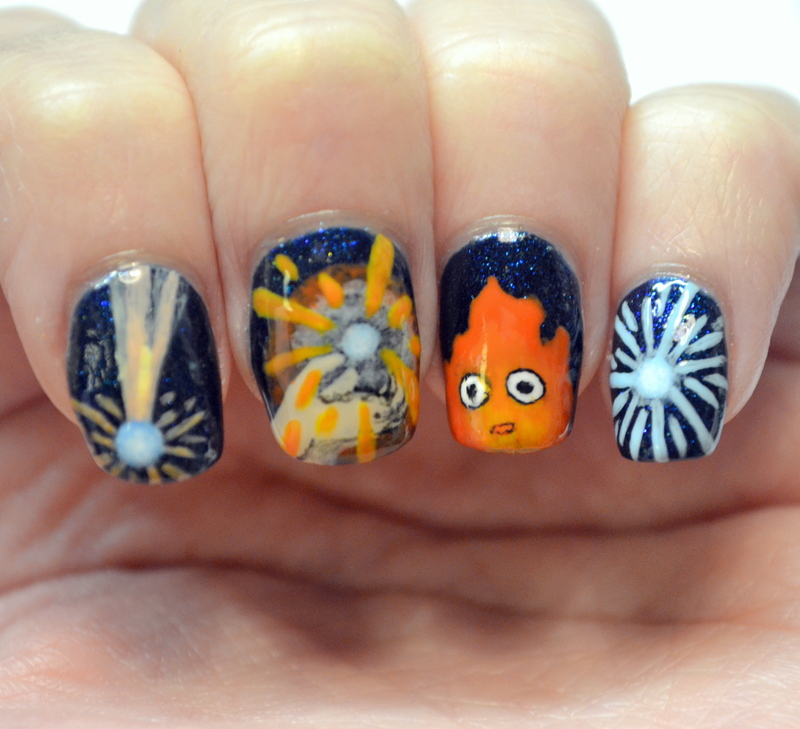 I sort of froze and had a “wow, I’m stupid” moment, and decided to take this nail art in a slightly nerdier direction. I know it’s not strictly windy weather, but it’s close enough! 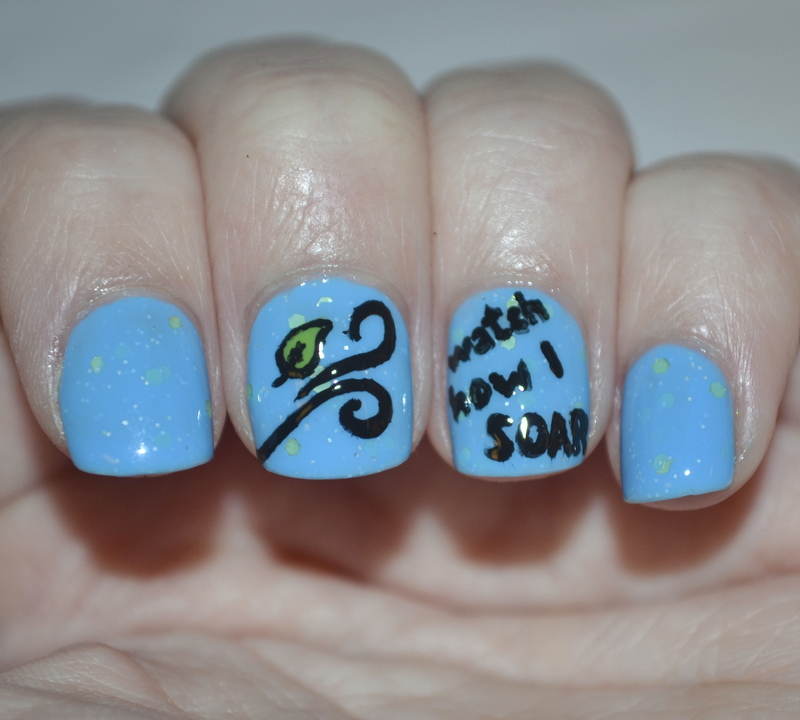 So, Firefly/Serenity nail art! 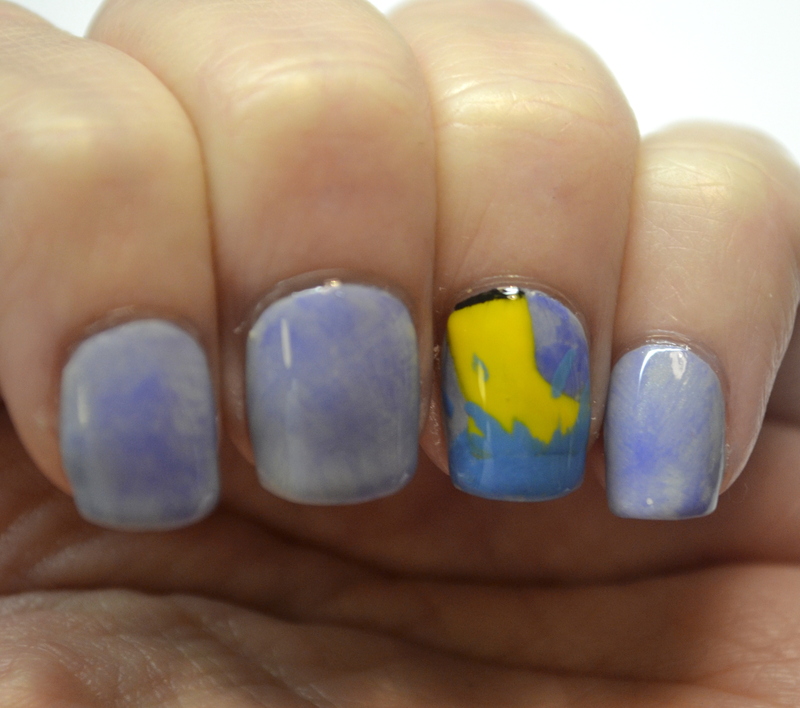 Once I started thinking about this idea, I realized I also have Lucky 13 Lacquer A Leaf on the Wind. It was one of my earliest indie purchases, actually, and I got sort of excited to wear it for a challenge that fits it so well. 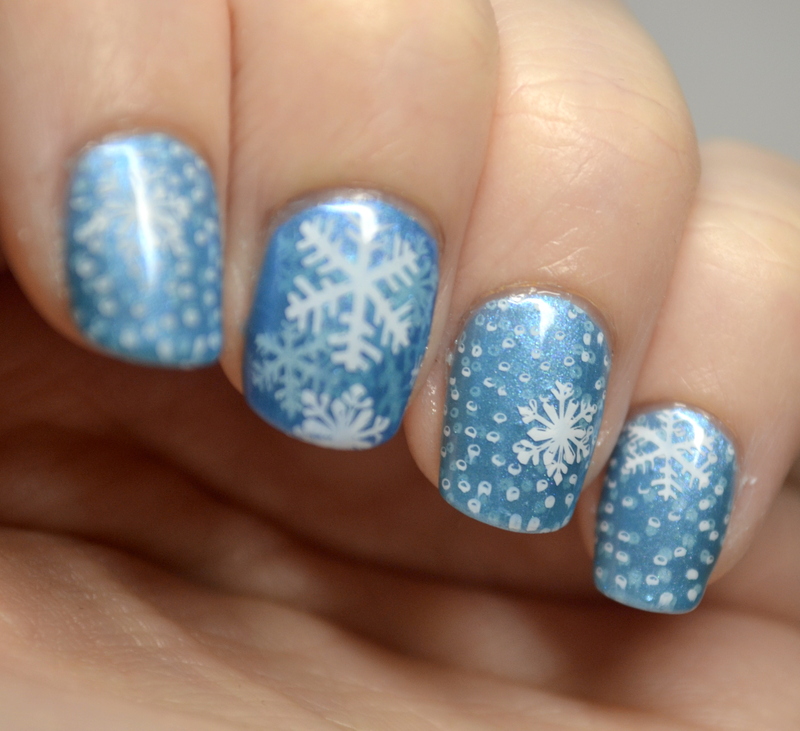 It’s a pretty sky blue polish with silver microglitters and small light green hexagon glitters. I love it because it incorporates two of my favorite colors without being too in-your-face. 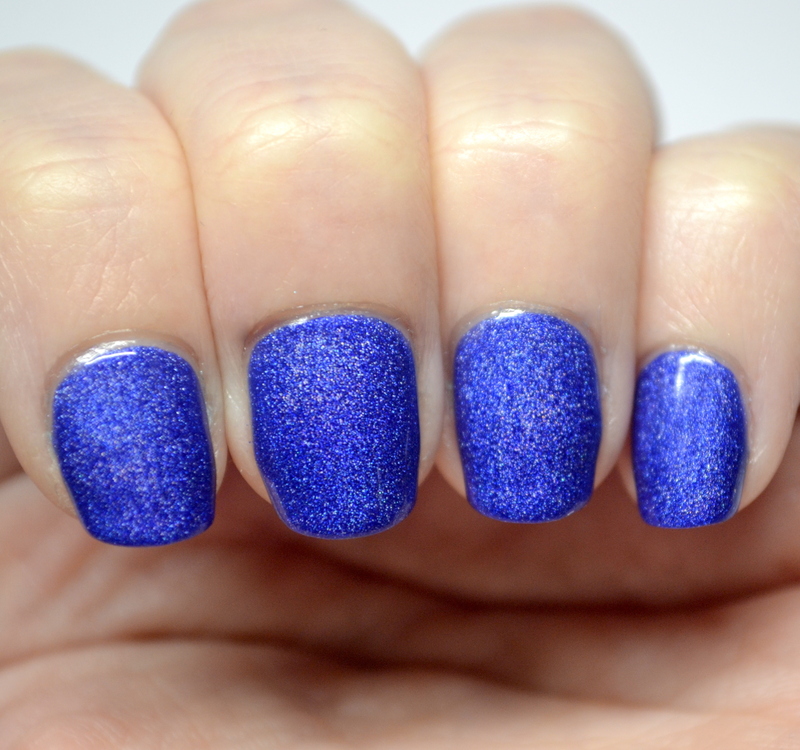 It was also good in 2 coats and despite sitting on my shelf for the year or so, I didn’t have to fish for glitters (which is a plus in my book because I didn’t even shake the bottle well). I used Kleancolor Black and China Glaze Gaga for Green for art itself. 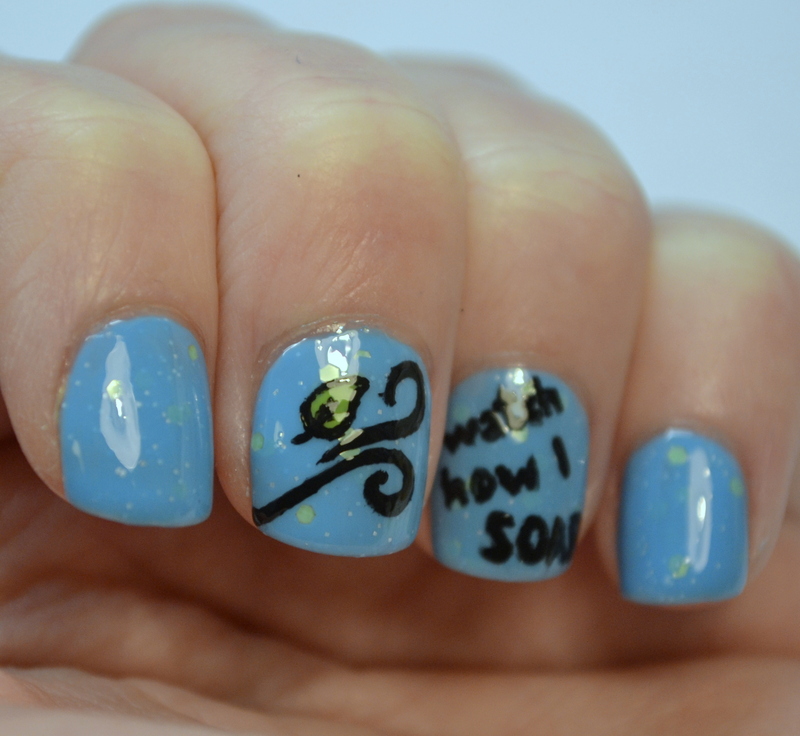 I almost made an attempt at adding Serenity to one of the nails, but then I looked at the two nails I had done, and I thought it would be a good idea to leave it as is (no pun intended). In my opinion it’s a fantastic follow-up message to the autism awareness prompt from yesterday. Plus I like the simplicity of it. And just to show A Leaf on the Wind on its own, here are some swatch photos! 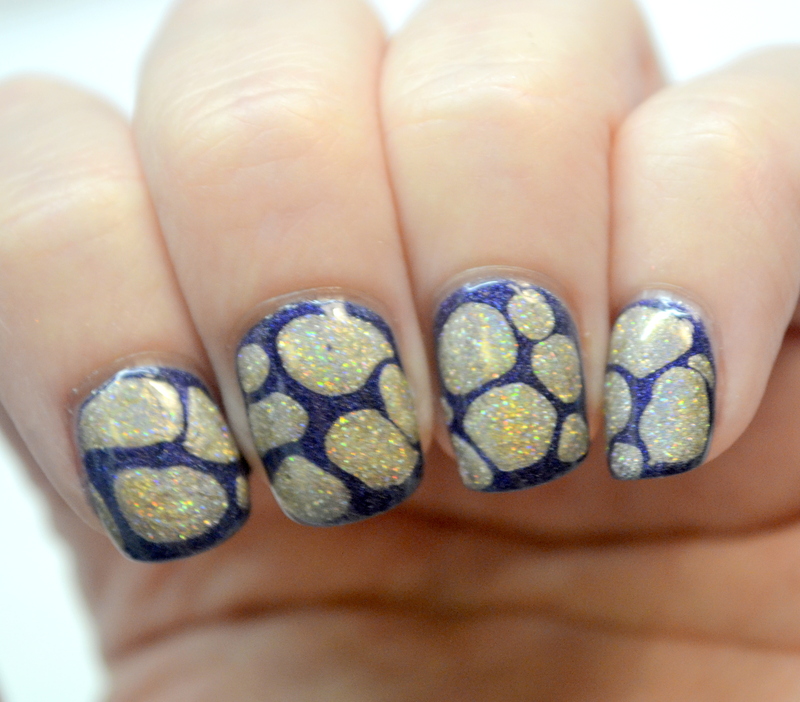 Seriously though, I like this mani so much that I think I’m going to wear it for a few days. What a great way to finish off a challenge!